Not to be missed, in the sense that you ought to try Fernet-Branca at least once. A violent, deliberate reaction to the placid Georgian squares around, with the windows laced together in vertical bands. What plain brickwork is left is then carved up by sinister thin pilasters. It is as near to expressing evil as a design can be. A long time ago, before I’d heard of Ian Nairn, I read a restaurant review in the Times by – who else? – Jonathan Meades in which he quoted that last line from the entry on Milner Square in Nairn’s London: ‘as near to expressing evil as a design can be’. The restaurant being reviewed was in France, the Auvergne region as I recall (I searched in vain for the article on the Times Digital Archive before I wrote this post). I can’t remember what prompted Meades to mention Milner Square in that context: it may have been the architecture of the place or perhaps even something about the food. What I do recall is the thrill of discovery: that one sentence introduced me to a writer with a unique sensibility. But it wasn’t just Nairn I hadn’t heard of. Despite having grown up just a mile from Milner Square I knew nothing of it. What was this place that had provoked Nairn to such an extreme judgment? I wasn’t living in London at the time but when eventually I moved back I tracked down a second-hand copy of Nairn’s London, then long out of print, and read the full entry (given above). It was just six lines, but what lines: impassioned, irresistible, unforgettable. (And there was now a second, and secondary, mystery: what on earth was Fernet-Branca? This was in the Dark Age before the Web. It took me years to find out and I still haven’t tried it, not even once.) Eventually too, I visited Milner Square. It was, to be frank, a disappointment to my amateur architectural sense: I felt no sense of evil or revulsion, nor of anything metaphysical at stake. I was in Islington and there was no malevolence oozing from the bricks and stucco. My primary impressions were of constriction and compression, narrow windowed terraces overlooking a square that was more of an oblong, with only two ways in and out. London squares usually feel open and spacious; Milner Square felt as secluded as a mews. Was it evil or simply eccentric (not that eccentricity is ever simple)? Yet there was clearly something going on, something that was out of joint, in the eyes and minds of people who knew more than I did. In his book Georgian London, the architectural historian Sir John Summerson wrote that ‘it is possible to visit Milner Square many times and still not be absolutely certain that you have seen it anywhere but in an unhappy dream’. The first Buildings of England volume on North London noted that ‘disintegration of the classical conventions shows itself sometimes naked, in sheer harshness and negation of harmonious proportions’. Strong stuff, but is a lack of harmonious proportions actually evil? 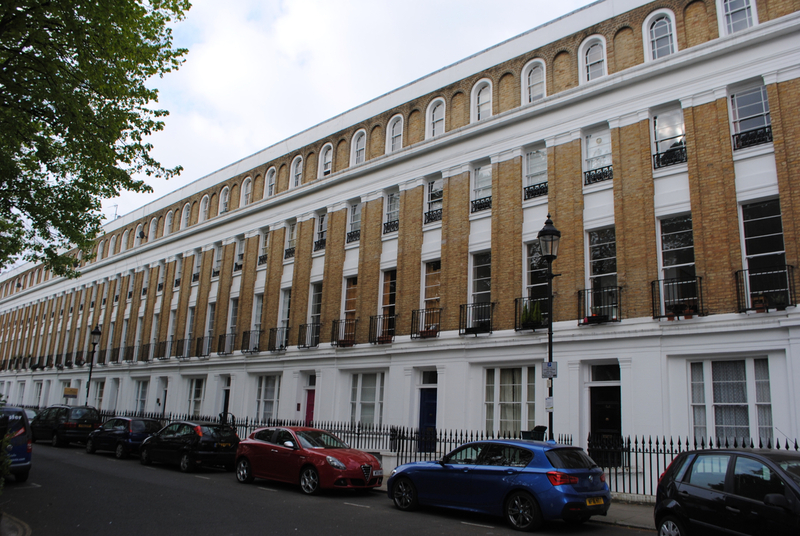 Milner Square, built in 1839-44, was designed by RL Roumieu and Alexander Gough, who worked in partnership for twelve years in the mid-19th century. Roumieu seems to have been the maverick of the two; he went on to design 33–35 Eastcheap, a vinegar warehouse in the City and an extraordinary piece of work. In another of his unforgettable judgments Nairn thought it ‘truly demonic, an Edgar Allan Poe of a building. It is the scream that you wake on at the end of the nightmare’. It takes a writer like Nairn to make you look at buildings afresh and also to make you think about what an interesting character RL Roumieu must have been (there is, as far as I know, no biography of Roumieu, and certainly no entry on him in the Dictionary of National Biography). Milner Square today is clean and well-maintained. Though I don’t think this would have influenced Nairn’s acerbic reaction, it must have looked and felt quite different in the 1960s, when he was writing. These grand squares on the fringes of central London were poverty-struck and neglected, tenement buildings containing slummy flats and bedsits. The atmosphere would have been seedy and oppressive, the place manifesting a kind of sick building syndrome before the term was invented. So far as I know Nairn wasn’t a religious man or a believer in the supernatural. Whatever concept of evil he had in mind was likely to have been a secular one, indicating anything from a very extreme kind of immorality to an act calculated to be destructive of another person’s humanity. And intention comes into the assessment as well. Could Roumieu and Gough consciously have been carrying out a project of evil intent, a nihilistic slap in the face of mid-Victorian sensibilities? The notion of a pair of diabolical architects is appealingly dramatic. Evil is a strong term to use of a building, even allowing for the fact that Nairn was always a polemicist. Think of other examples of what might be classified as evil architecture and almost inevitably one thinks of the Nazis and of Albert Speer. 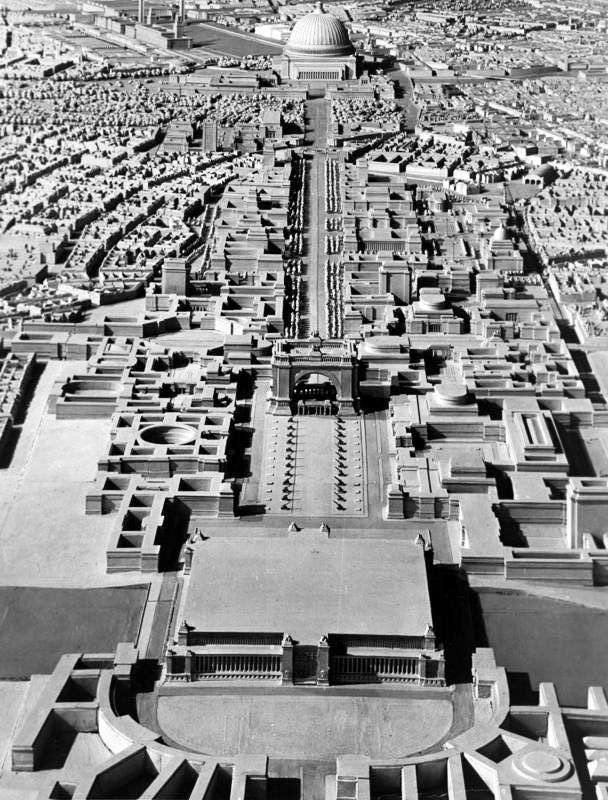 Speer’s most ambitious project, for a rebuilt Berlin (‘World Capital Germania’), was of course unrealised but he played a leading role in the projection of the Reich’s power through buildings such the New Reich Chancellery and the ‘cathedrals of light’ he designed for the Nuremburg night rallies. Speer was a Nazi stalwart but did that make his designs intrinsically evil or was it more that architectural grandiosity was used to support evil ends? And what about Jeremy Bentham, an Enlightenment man, a rationalist, an atheist, a utilitarian, a philosopher dedicated to the greatest happiness of the greatest number (I’ve written here about Bentham’s Auto-Icon at UCL)? Bentham came up with a new prison design, called the Panopticon, a circular structure which enabled a single warder to observe each cell from a central vantage point. The prisoners, each of them held in isolation, would not know at any given moment if they were being observed or not. Bentham intended this oppressive uncertainty to modify their behaviour. The Panopticon was, in his own words, ‘a new mode of obtaining power of mind over mind, in a quantity hitherto without example’. The Panopticon was never built but what a monstrous scheme it was, more evil, to my mind, than any design of Speer’s. I went back to Milner Square again when I was thinking about writing this piece. I still can’t see the evil in it, even though I appreciate what Nairn was getting at more than I did on my first visit all those years ago. And I suppose that’s what the best critics do: make us return to ideas and objects and places, and see more, think more, understand more each time we do so.